160,000 Years Carbon dioxide and global temperature are highly correlated. 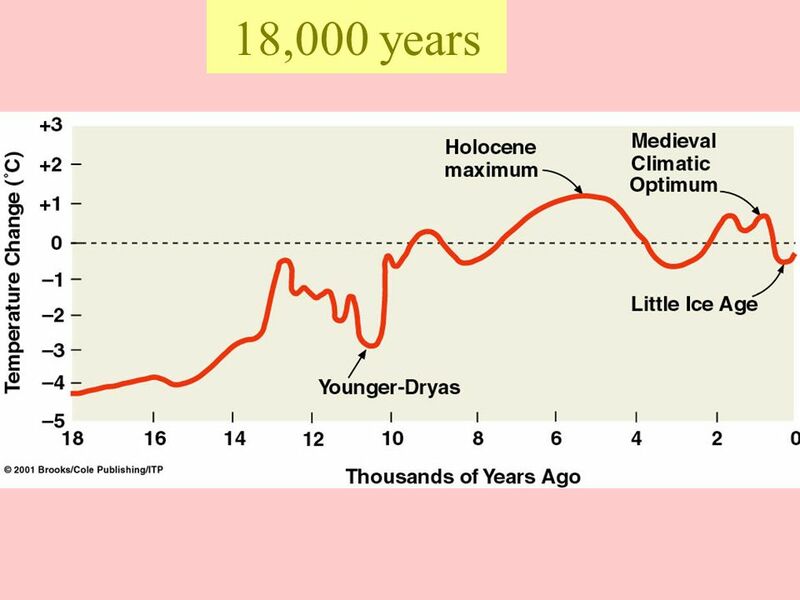 Temperatures of the past 160,000 years have varied greatly between ice ages. 1 160,000 Years Carbon dioxide and global temperature are highly correlated. 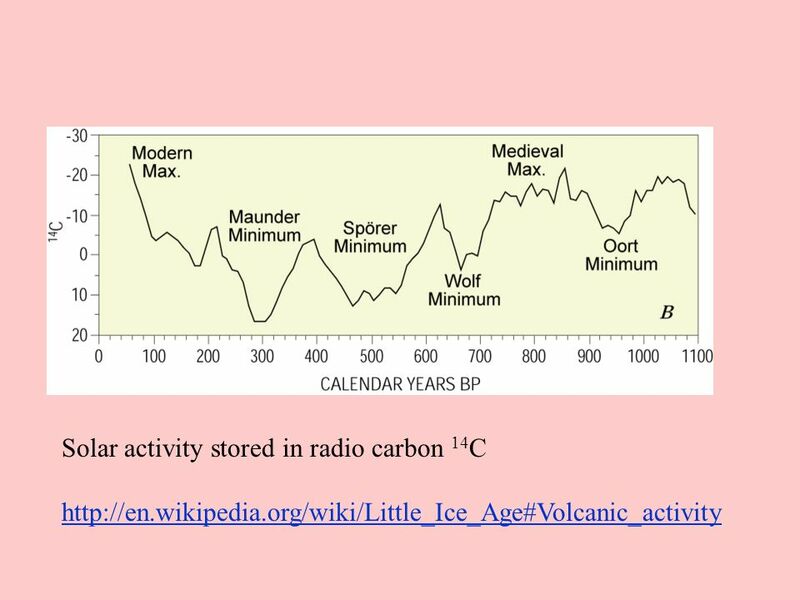 Temperatures of the past 160,000 years have varied greatly between ice ages and inter-glacial times like the present. Global temperature variations of up to 5 degree C and carbon dioxide fluctuations from 200 ppm to 280 ppm between Glacial and most recent times. Sea levels have also increased by about 300 feet between the last Glacial maximum and the present. Carbon dioxide and global temperature are highly correlated. 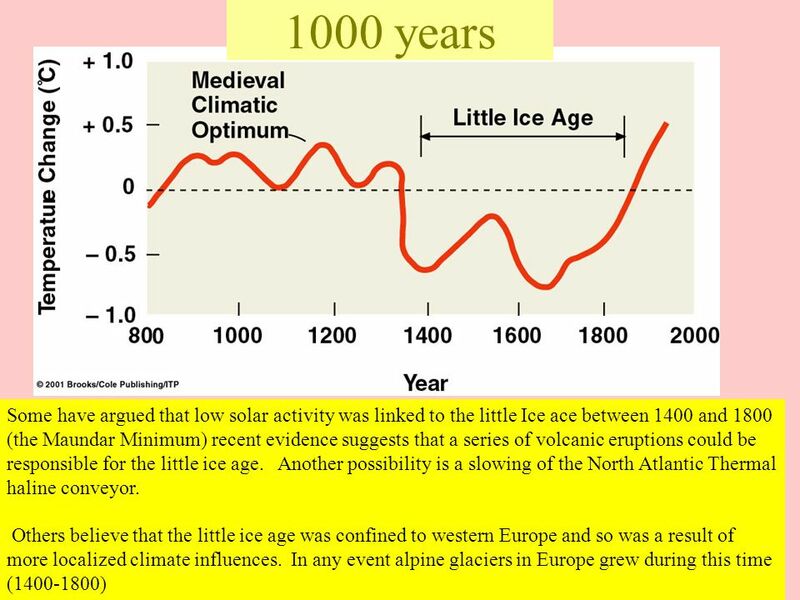 Temperatures of the past 160,000 years have varied greatly between ice ages and inter-glacial times like the present. Global temperature variations of up to 5 degree C and carbon dioxide fluctuations from 200 ppm to 280 ppm between Glacial and most recent times. Sea levels have also increased by about 300 feet between the last Glacial maximum and the present. 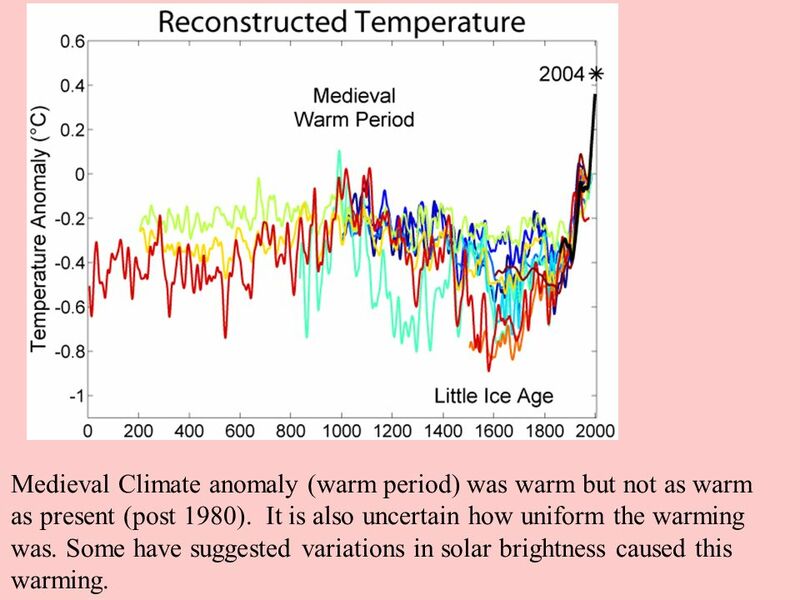 3 Medieval Climate anomaly (warm period) was warm but not as warm as present (post 1980). It is also uncertain how uniform the warming was. Some have suggested variations in solar brightness caused this warming. 7 Last 140 years Observations suggest that global mean surface temperatures have increased by about 0.5 degree C (0.9 F) over the past century. Observations suggest that global mean surface temperatures have increased by about 0.7 degree C (1.3 F) over the past century. Observations suggest that global mean surface temperatures have increased by about 0.7 degree C (1.3 F) over the past century. 1) Most warming at High NH latitudes. 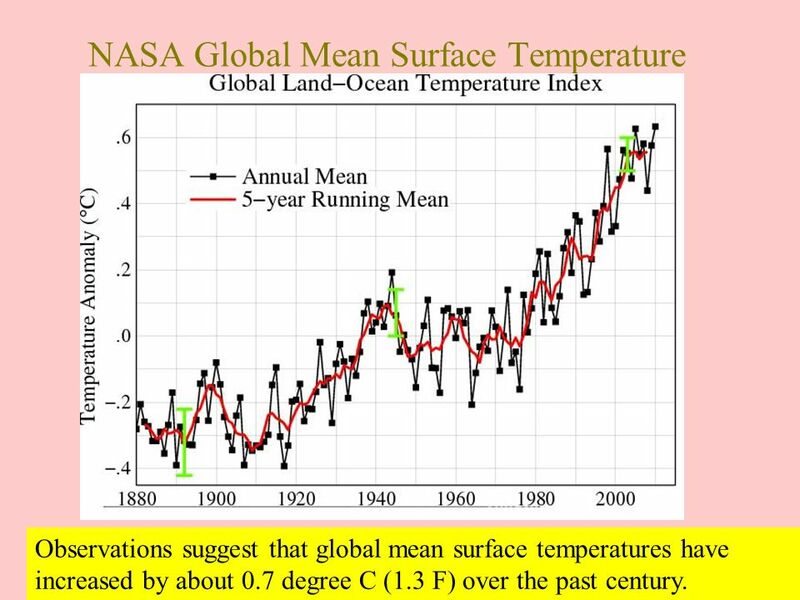 2) More warming over land than oceans. 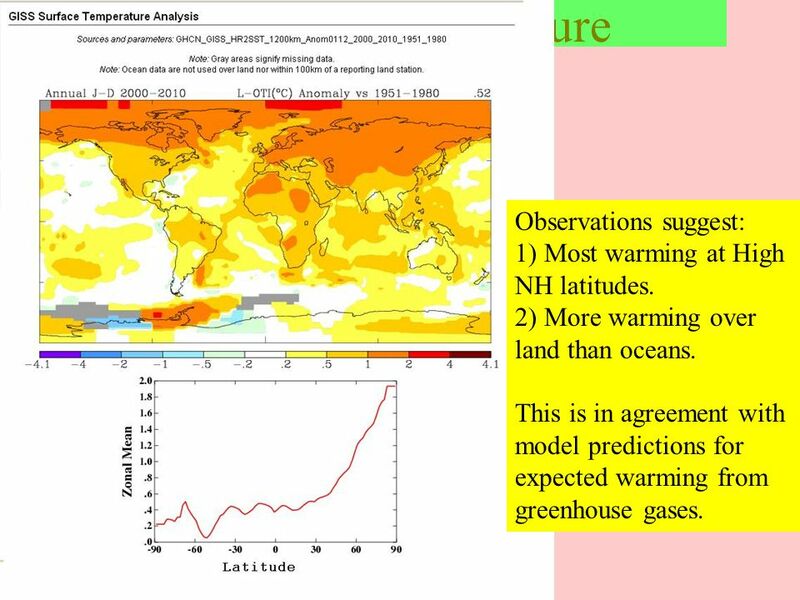 This is in agreement with model predictions for expected warming from greenhouse gases. 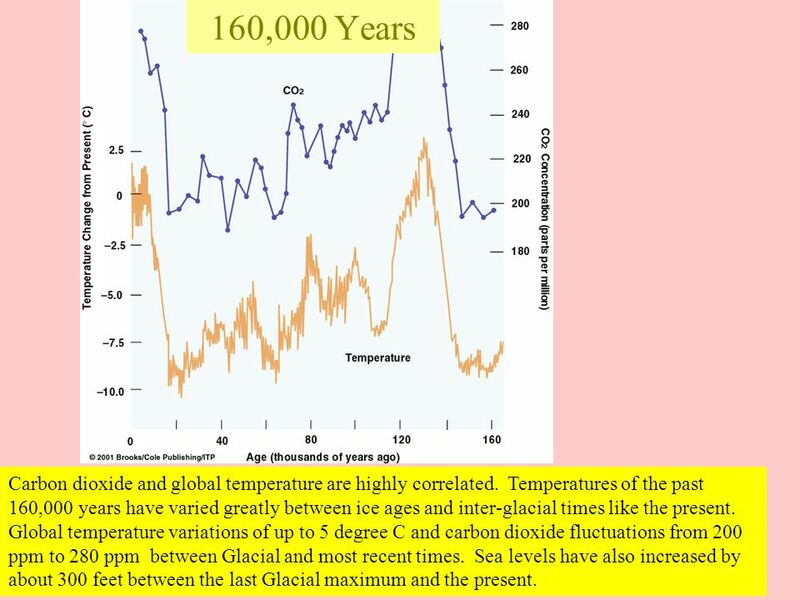 Download ppt "160,000 Years Carbon dioxide and global temperature are highly correlated. Temperatures of the past 160,000 years have varied greatly between ice ages." Volcanoes Large volcanic eruptions with high SO2 content can release SO2 into the stratosphere. This SO2 eventually combined with water vapor to make. Earths Climate System Dr. R. M. MacKay. Natural and Anthropogenic Climate Forcing. GLOBAL CLIMATE CHANGE OCEAN IMPACT. Temperature Change Over Past 400,000 Years- Ice Core Data. Elizabeth Machado.  The Medieval Warm Period (MWP) is the name given to the warm period observed in many parts of the world between 900 and 1200 AD. Global Air temperature from 1850 The time series shows the combined global land and marine surface temperature record from 1850 to The year 2007. Climate change can be discussed in short, medium and long timescales. 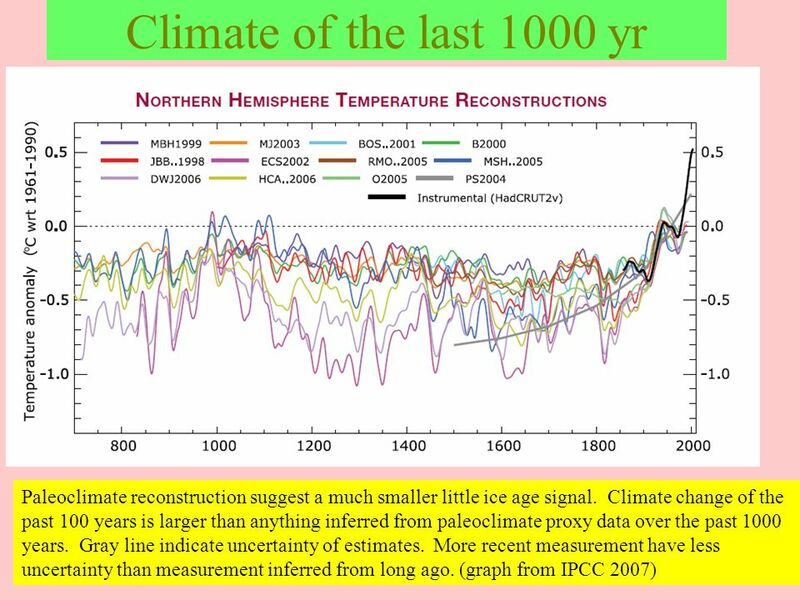 Short-term (recent) climate change is on a timescale of decades, an example would. Climatology Climatology is the study of Earth’s climate and the factors that affect past, present, and future climatic changes. Climate describes the long-term. Global Warming and Climate Sensitivity Professor Dennis L. Hartmann Department of Atmospheric Sciences University of Washington Seattle, Washington. Global Warming The Earth's climate has changed many times in the past. Subtropical forests have spread from the south into more temperate (or milder, cooler. 3. Climate Change 3.1 Observations 3.2 Theory of Climate Change 3.3 Climate Change Prediction 3.4 The IPCC Process. Arctic summers ice-free by 2013 predict scientists European heat waves kill 35, – the UK’s warmest year on record Rising sea levels threaten Pacific. 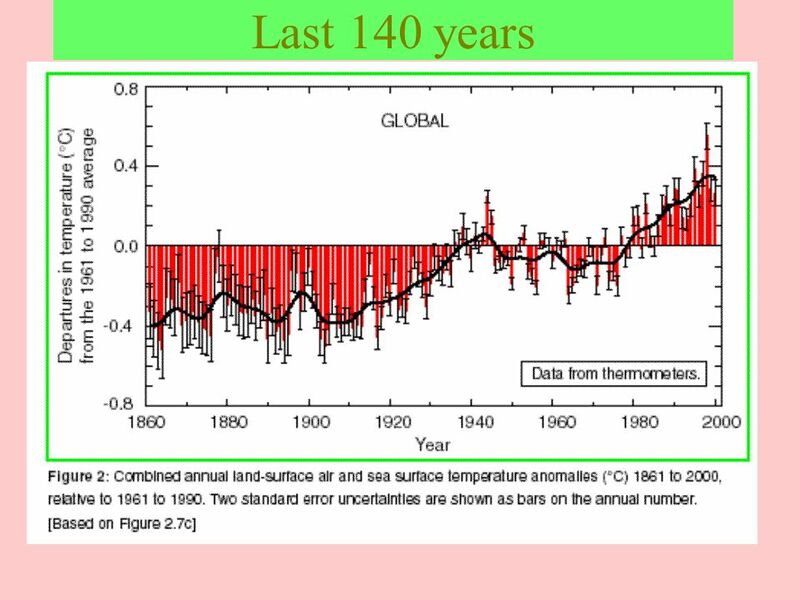 CLIMATE CHANGE Global Temperatures: Past, Present, and Future. 1. How has the climate changed during the recent past? 2. What can we say about current climate change? 3. How do climate models work and what are their. Protecting our Health from Climate Change: a Training Course for Public Health Professionals Chapter 2: Weather, Climate, Climate Variability, and Climate. Class #11: Wednesday July 21 Earth’s changing climate Chapter 16 1Class #11 Wednesday, July 21. Earth Science Notes Climate Change. Lecture 35: The Global Warming Debate Ch. 18 The Global Warming Debate Ch. 17, Ch Is global warming real? (Or is global warming happening?) 2.What. POLAR EXPLORER i EXPLORING SEA LEVEL RISE As a polar explorer you and your team will be collecting evidence of changes occurring throughout the world that. Anthropogenic Climate Change The Greenhouse Effect that warms the surface of the Earth occurs because of a few minor constituents of the atmosphere. Burning issues at climate science – policy interface Judith Curry.